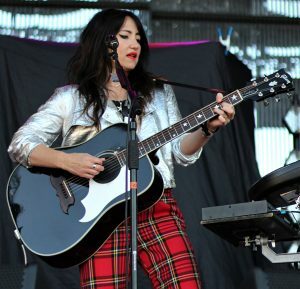 City Life were invited to meet up with KT Tunstall, who was performing on the Simple Minds Grandslam Tour with Chrissie Hynde at the Mary Slessor Gardens V&A opening week celebrations. So, on a cold and crisp Sunday morning, with some excited anticipation, we found ourselves standing at the Robert Burns monument outside the McManus Galleries across from KT’s old school, the High School of Dundee. We were told she was inside the new DC Thomson media building and here we were, outside keeping Rabbie company, wondering what to expect, pacing up and down, continually looking over to DC Thomson’s for any wee signs of movement. As we stood beside our fellow street observer Rabbie, we surprisingly noticed there was a verse of a Burns’ poem on the base of the monument. How had we bypassed this all these years? I suppose Rabbie has watched over many a bairn from the Dundee High School over the years, including KT, and maybe this was a wee sign from the poetic heavens. There had to be a message in this. What was it? Here we were, about to meet a ling’ring star; and here we were, greeting the early morn’ with the poetic spirit of Burns himself; whilst a symbolic day in Dundee’s new history was being usher’st in with the V&A Museum concert celebrations later that day. The shivers were tingling down the spine as we turned back to look hopefully once again over to DC Thomson’s. 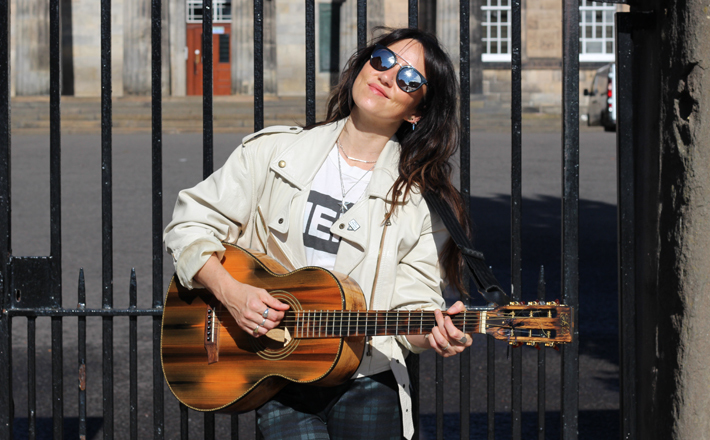 Suddenly a warm Scottish voice cheerily shouted “hey” behind us, like a familiar old friend, and, as we turned around, there she was, the new millennium’s female poet, KT Tunstall, heading straight for us with a big warm smile. This shining ling’ring musical star just usher’st in one of City Life’s most memorable days. 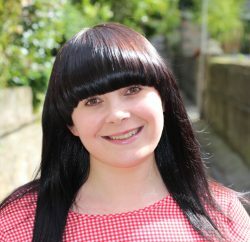 Kate Victoria Tunstall was born in Edinburgh on 23rd June 1975, but after eighteen days with her biological mother she was plucked like a star from the heavens and placed into the loving arms of her universal parents, Rosemary Tunstall, a local school teacher from St Andrews, and David Tunstall, a physicist who would share his passion for astronomy with KT as a child. As KT recounts, one of her fondest childhood memories is watching Halley’s Comet flying through the night sky, with her father in 1986. KT attended Lawhead Primary and Madras College in St. Andrews, then the High School of Dundee, before finishing her schooling in the USA. 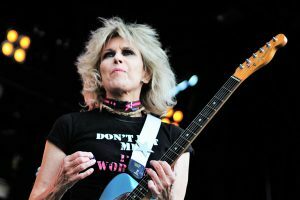 She earned her BA in Drama and Music in 1996 from the Royal Holloway, University of London, and was awarded an honorary doctorate by Royal Holloway in 2011. Primal hand drumming on the guitar set the beat, then vocalised “woohoos”, a few scruffs on the guitar strings and some handclapping followed. Foot stomping and tambourine were thrown into the mix, all the while foot pressing the loop pedals left and right. 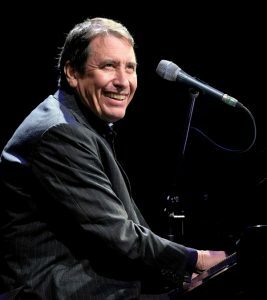 Suddenly, through all this cosmic chaos, a vibe materialized in the Jools Holland studio. Some of the audience were already clapping, others were tapping their feet, getting into this new sound and getting into this unique girl’s groove. 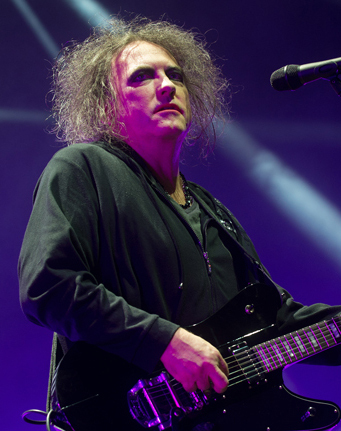 Even Robert Smith of the Cure was looking on mesmerised. KT was now swaying her hips to the rhythm, like a flame on a candle. She was emanating a feel-good, free-spirited, soulful sound. Before you knew it, she was back on the guitar and all these elements were looping back. Wow, could she play that guitar. Then came that heart melting smile and dark sparkle in her eyes. Yes, she was ready, she’d been waiting and preparing for this for a long time, she was fiery, she was passionate, she was hungry. 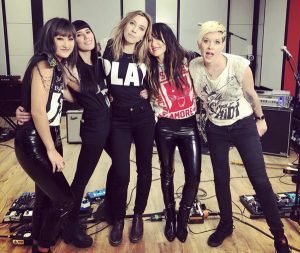 Then came the voice and that first line, “Well, my heart knows me better than I know myself, so I’m gonna let it do all the talking”, and that was it, the universe had spoken and KT Tunstall had shouted back. She’d absolutely nailed it, she’d let her heart do all the talking alright, and proclaimed to the whole world that a new female musical comet was ready to blaze her trail. 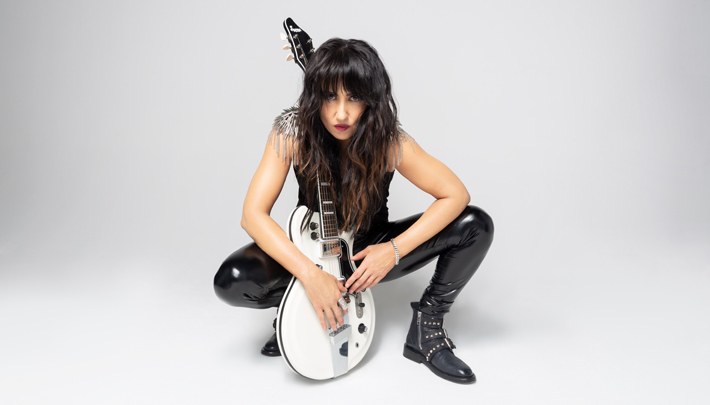 Her debut album, Eye to the Telescope, that followed in 2004, was inspired by her childhood experiences at her father’s physics laboratory, especially her 1986 sighting of Halley’s Comet. The album led to her nominations for the Mercury Prize in 2005, BRIT Awards for Best British Live Act and Best Breakthrough Act in 2006, and the Grammy Award for Best Female Pop Vocal Performance in 2007. She eventually won a BRIT Award for Best British Female Artist and a European Border Breakers Award, both in 2006. 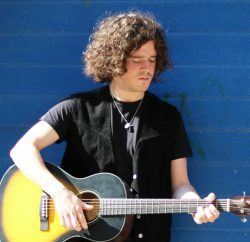 The single “Black Horse and the Cherry Tree” was given the Q Magazine Award for Best Track in 2005, and “Suddenly I See” won the Ivor Novello Award for Best Song in 2006. 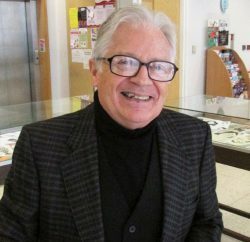 “Suddenly I See” became a popular hit and has been featured in The Devil Wears Prada; Blind Dating; Love, Rosie; Ugly Betty; Grey’s Anatomy; the video-game Thrillville; and as a campaign song of the US presidential campaign of Hillary Clinton in 2008. She has now released six albums internationally and has also written for movie soundtracks including “Boy” for The Kid; “Miracle” for Winter’s Tale; “We Could Be Kings” for Million Dollar Arm; and “Float”, “Strange Sight” and “1000 Years” for Tinker Bell and the Legend of the Never Beast, to name but a few. No’ bad for a Dundee school lass, eh?! After a photoshoot outside her old school we sat down for a coffee in the Counting House to ask her more about life, music, Dundee and her new album WAX. 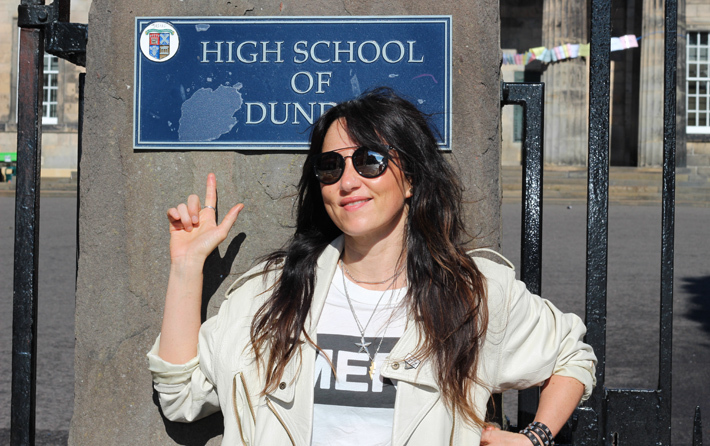 It genuinely was a real pleasure to spend a brief moment in time with KT Tunstall, who had arrived back at the gates of Dundee High School like an orbiting comet all these years later. The little school girl, watched over by Robert Burns all those years ago, had returned full circle; all grown up, now a superwoman with a whole travelling ensemble of global music superstars including Jim Kerr, Charlie Burchill, Ged Grimes and Chrissie Hynde, to celebrate a new chapter in Dundee’s history. She’d really done it, she’d blazed her trail around the planet, from her first days of picking up the guitar in Dundee, and yet, even now, was still shining bright, still natural, still beautiful and still passionate. So, set your telescopes up to the heavens and keep your eye on this shooting star, forever travelling, always looking through her own telescope of life to see where her next journey may take her. So, KT, keep on blazing your trail until you find, like Robert Burns says, “thy place of blissful rest”! 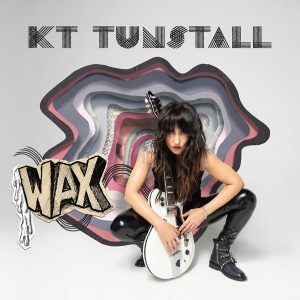 Check out our WAX album review here.